Is Getting Paid for Finding Deals a Good Idea? This week Peter and I want to congratulate elite client Doug Kiehn for another successful fix and flip deal. Next week we close of the sale of a deal in Seattle WA with a net profit of $97,000! We’re very excited for Doug and are working hard towards his “Freedom Day” (when he fires his boss). This leads me to something else we wanted to talk to you about. This year Peter and I have been sitting on too much excess funds. Our money investors have more money then we have deals for (great problem). So we’ve been working on a finders program called the Quick Flip Money Machine™. We’d like to share with you a little about it and then we’d like your suggestions and feedback. For us, of the 4 areas of focus, FINDING is our most challenging component. We have the other 3 already in place. We need more help FINDING deals. FINDING deals is also the quickest way to cash because you don’t have to wait to fix it and sell it. So what we are setting up is a way to pay you for finding deals. We pay you for finding the deal. To make sure you have the tools to succeed, we’ll provide you with a proof of funds to make all-cash offers and show you the kinds of deals we’re looking for. Then you go out in your market and start making offers, find a deal and we’ll pay you for it! How much do you think would be a fair finder’s fee per deal? We were thinking between $3,000 and $10,000. Remember, you get paid out up front not after it’s fixed and sold. 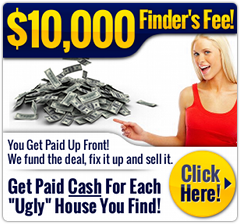 By the way, currently our Residential Back Flip™ finders program pays $10,000 and that seems to be working really well. What other suggestions or ideas do you have for us? What would you like to see that would make this program work really well? Your input is very important to us so please post your ideas below in the comments section. Watch for more details on the Quick Flip Money Machine™ in the near future and happy investing! Click on this picture to see the beautiful job Doug did on this rehab!